In our local weekly "Hed ha'Qrayot" (The Qrayot Echo) of today, there is an item about the Israeli delagation to the "Special Olympics Games" which is a sport event fot people who suffers from mental-retradition. 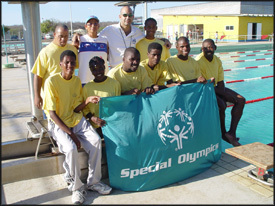 In the item there was a photo of a flag with a logo and the inscription "Special Olympics". The Hebrew letter "Shin" below (the second letter in Israel) suggest it is the IL delagation. Dov Gutterman, 16 November 2001. Posted by Erik Bell, 14 June 2003. Erik Bell, 14 June 2003. Posted by Erik Bell, June 14, 2003. 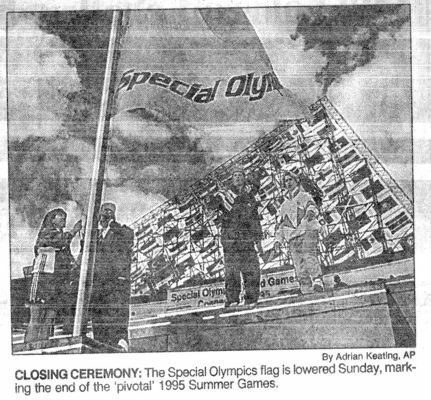 This is a photo that originally appeared in the USA Today newspaper showing the Special Olympics Flag as it was lowered at the 1995 World Summer Games Closing Ceremony. 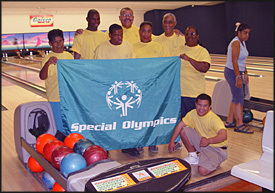 I found the following photo on the Special Olympics International homepage. 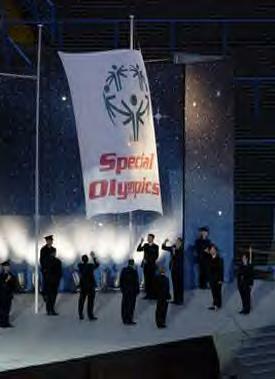 It shows the Special Olympic Flag being lowered during the Closing Ceremony of the 2003 World Summer Games. The colors must have been changed since 1999. The flag used in 1995 and 1999 was white with bright blue logo and text. The flag in the photo has a green logo and red text. The Ist International Special Olympics at Chicago in 1968 used a similar flag with a gold logo and text on a dark (navy?) blue field. I don't know how long that first flag was used or when the white flag with the blue logo and text was introduced. Erik Bell, 13 July 2003. Mark Sensen, 17 July 2003.